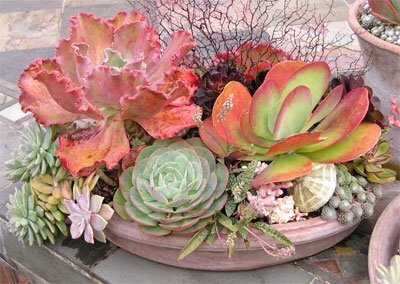 What's in this gorgeous succulent planter - I want one! This is a picture that I've seen several times on the internet, and I think it's one of Thomas Hobbs fabulous planters. I really want to know what the plants are so I can make one like this for my patio. Can you tell me what these incredible succulent plants are? Comments for What's in this gorgeous succulent planter - I want one! That really is a planter to covet! Love the colours, and the textures go together so well...I can see why you want to copy it, Marie. The larger two are Flapjacks, or Kalanchoe thyrsifolia with the large leaves, the curly one is an Echeveria, possibly 'Curly Locks' or another of the gorgeous frilly kind of which there are several that take on the rainbow of colours under certain conditions. The greeny blue one tumbling off the edge is Pachyveria, the pale mauve one is most likely Graptopetalum pentalum 'Superbum'. In the front is a smaller Echeveria, possibly imbricata or another species, and there are also some tiny Sempervivum arachnoideum clustered on the other side of the front. At the very back there are some dark burgundy coloured Aeonium, either 'Schwartzkopf' or another similar variety. Also in the very center at the front is a little orchid, the name of which escapes me at the moment. All in all, a spectacular and beautiful planter. The addition of shells and other sea shore accents makes it look as though it's under the sea, an entirely possible fantasy. The giant frilly Echeveria is E. 'Mauna Loa'. The tiny little orchid at front-centre is Scilla violacea, which has had a name change (more than 30 years ago) to Ledebouria violacea. There is also a little Crassula poking out on the right-hand side of the dish. Going by the shape of its leaves, it is some type of C. ovata cultivar. Hope that helps.